Mo Farah: World Cup soccer star? 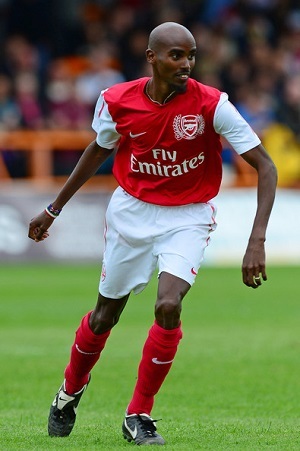 Mo Farah plays in a 2013 charity match in London. With the World Cup underway, it seems everybody in the sports world has soccer on the brain. Over at Athletics Weekly, a British track and field publication, writer Jason Henderson put together a soccer dream team of track athletes, which includes Somali-British Muslim middle-distance superstar Mo Farah and Moroccan Muslim middle-distance legend Hicham El Guerrouj. The reigning Olympic and world champion (representing Great Britain) in the 5,000 and 10,000 meters, Farah makes the squad as a midfielder alongside British sprinter Christian Malcolm, British hurdler Dai Greene and Somali-British middle-distance runner Mukhtar Mohammed. El Guerrouj, who retired in 2006 with world records in the mile and 1,500 meters to his name, was picked as the goalkeeper. Olympic long jump gold medalist Greg Rutherford (Great Britain), retired 800-meter legend Maria Mutola (Mozambique), world champion hurdler David Oliver (USA), sprinter-turned-analyst Ato Boldon and the incomparable Usain Bolt were among those also named to the squad. Putting some of the world’s top track stars together on the soccer pitch isn’t much of a stretch. Henderson points out that track is full of former soccer players, and many of the athletes he mentions either played pro soccer at some point or were in the youth-development programs of some high-profile clubs in some of the world’s top soccer leagues.